In all the multiverse there has to be a Rick and Morty that are California stoners jamming their way through time. Even though time travel is impossibly dangerous. And you know Rick and Morty have the chops to bring the Wyld Stallions into the big leagues. 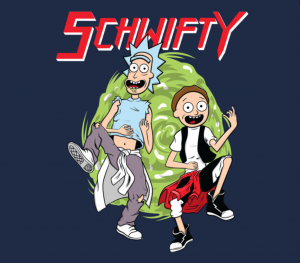 Just look at what they did with Get Schwifty. They literally saved the world. Who’s to say they couldn’t make the world a better place with the musical genius behind that song? Wrap this cloth around your torso to inspire you to be like Rick Theodore Logan and Morty S. Preston, Esq.